Over 26 million displaced girls and women are estimated to be menstruating around the globe. 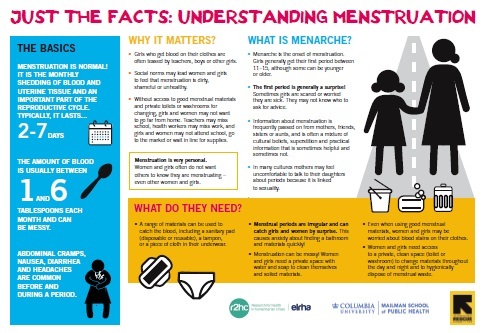 A significant but often overlooked issue facing these girls and women is their ability to privately, safely and comfortably manage their monthly menstruation. In many humanitarian emergencies, there is a serious lack of access to even the most basic materials needed for managing the blood in addition to a lack of appropriate sanitation facilities (including water), which are critical for addressing menstrual hygiene. Privacy in emergencies is often scarce, and even if toilets are available they often lack locks, functioning doors, lighting and separation between genders. 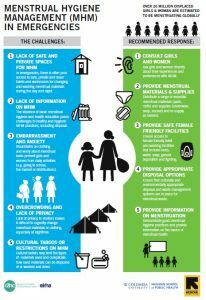 These barriers are often intensified by cultural beliefs and taboos surrounding menstruation which can restrict the movements and behaviors of girls and women (such as attending school, waiting in line for distributions or going to the market). The MHM in Emergencies project is a collaboration between Columbia University’s Mailman School of Public Health and the International Rescue Committee. The aim of this project is to expand the evidence and guidance on MHM during emergencies. 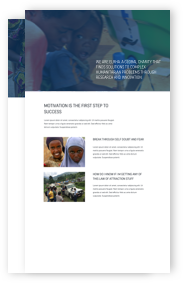 Along with adding to the evidence base, the project has developed an MHM in emergencies toolkit in partnership with the humanitarian response community. Formative assessments were conducted in two humanitarian response settings (Myanmar and Lebanon) at the onset of the project in addition to interviews with global humanitarian experts and a desk review. The toolkit was then piloted in an on-going emergency context (refugee camps in Tanzania) where it was evaluated and further improved upon. Learning from these various assessments has been utilized for both the development of the toolkit and a series of academic publications.